As the United States wrestles with issues of immigration and the status of asylum seekers, the history of refugee treatment can provide important lessons and insights. A primary concern remains how to resettle or encamp non-citizens who claim refugee status because of persecution or violence in their home countries. As lawmakers remain deadlocked on solutions, this fraught process is haunted by accounts of mistreatment of asylum seekers in detention, separation of children from parents, housing of children in cages, and the deaths of children and adults in US custody. The refugee camp experience of Britain may be instructive in this era of mass immigration. When you think of camps, images of twentieth century Britain probably don’t spring to mind, but British camps housed hundreds of thousands of refugees over the course of the twentieth century in response to an array of conflicts and upheavals. However, the full story of these camps has been virtually forgotten in the annals of Britain’s past. 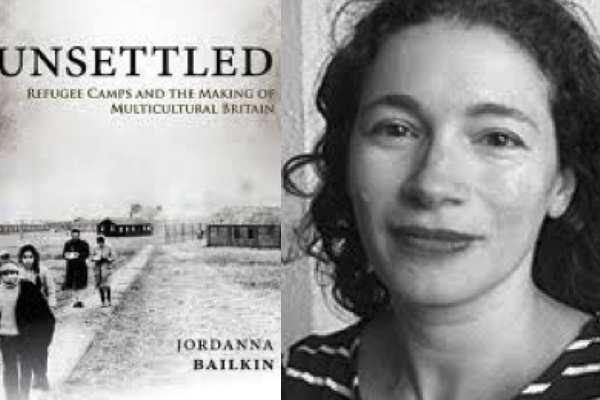 To correct this oversight, acclaimed historian and history professor Jordanna Bailkin scoured national and local archives in Britain and interviewed dozens of former refugees, camp workers and local citizens to reveal this mostly ignored and complicated story, as she recounts in her groundbreaking new book, Unsettled: Refugee Camps and the Making of Modern Britain (Oxford University Press). With a focus on the period from the First World War to the 1980s, Professor Bailkin discusses the plight of refugees who arrived in Britain, from Belgians, Basques, Jews and Poles who fled war to Hungarians, Anglo-Egyptians, Ugandan Asians, and Vietnamese who faced expulsion and violence. She brings to life the everyday experiences of refugees, British citizens, and camp staff as they made friends, married, gave birth, ailed, died, flourished, failed, and together weathered times of conflict and times of harmony. As the book stresses, the policies giving rise to these camps were critical in shaping today’s multicultural Britain and also served as antecedents to the treatment of immigrants and refugees now. Unsettled offers lessons and warnings for the massive refugee crisis today in its examination of the experience of a modern liberal democracy with refugee camps that brings forth both the humane and the brutal aspects of policies enacted and implemented by Britain in the twentieth century. The book stands as a powerful testament to the idea that, despite differences such as nationality or race or immigration status or religion, people are much more similar than different, especially in their needs and desires and hopes. Jordanna Bailkin is the Jere L. Bacharach Endowed Professor in International Studies and Professor of History at the University of Washington in Seattle. She specializes in the history of modern Britain and the British Empire. Her other books include The Culture of Propertyand The Afterlife of Empire, which won the Morris D. Forkosch Prize from the American Historical Association, the Stansky Book Prize from the North American Conference on British Studies, and the Biennial Book Prize from the Pacific Coast Conference on British Studies. Professor Bailkin generously discussed her new book and her findings on British refugee camps at her office at the University of Washington, Seattle. Robin Lindley: Congratulations on your new book Professor Bailkin. Your research on this forgotten refugee history in Britain was truly extensive. Did Unsettled grow out of work on your previous book, The Afterlife of Empire, about post Second World War Britain, or was there an event or incident that sparked Unsettled? I had never heard that there were Ugandan Asian camps in Britain, so I didn’t know what he was talking about or where these camps were. I never found a response to this proposal, though there were other New Towns later that tried to attract Ugandan Asians. The idea of camps stuck with me because it’s not a word that we associate with metropolitan Britain. What did he even mean by a camp when he mentioned Ugandan Asians? When I started looking into the issue, I found there were 16 Ugandan Asian camps in Britain from 1972 to 1973. They had a lot of euphemistic terms to describe them like “reception centers” or “resettlement centers” and they were also often referred to as camps. That was the starting point for the book and, initially, it was going to be a book about the Ugandan Asian camps in the 1970s. But, in investigating these camps, I realized there was a longer history of these places being used for other refugee groups. In particular, the Poles had been in camps (after the Second World War) for a much longer time. That made me look backwards and forwards from the seventies and through the whole twentieth century arc of encampment in Britain. Robin Lindley: What was the historical problem or theme you were addressing in Unsettled? Professor Jordanna Bailkin: Britain has long had a sense of itself offering refuge to a number of different people through the twentieth century and an image of its own tolerance and generosity. This image is not necessarily incorrect, but camps are very much at odds with that narrative. That conventional narrative moves quickly from the moment when people fleeing a country where they’re being persecuted to their assimilation in Britain and their integration into a British community. Or, alternatively, their reimmigration elsewhere. I was really interested in pausing that narrative and focusing on the moments when people were in camps because that’s a moment that both many refugees don’t like to talk about and that the state tends to gloss over in its own history of refugee dealings. It doesn’t fit well with the stories of being self-made and being successful within a single generation, nor with the story of the state’s generosity. Something is skipped over in that narrative. Sometimes people stayed in camps only a few days and sometimes for years and I wanted to zero in on this moment encampment in the lives of refugees and the lives of locals, and ask what was it like to live in a camp? What was it like to live near a camp? What was it like to run or volunteer in a camp? What do all of those experiences tell us about the experience of being in twentieth-century Britain that’s not easy to see otherwise. What I saw was very unexpected encounters between different groups of refugees, between refugees and locals, and refugees and citizens that were really specific and distinctive to refugees in the camps that didn’t happen other places. And the camps are in many bizarre locations, as you can see from the map in the book. They were all over the place. Robin Lindley: And the book is organized thematically rather than chronologically. Professor Jordanna Bailkin: Organizing it thematically was an important choice for the book. We think of encounters across cultures in Britain as happening in major cities like London or Leicester. I wanted to look at other spaces, some of which were rural and in the middle of nowhere that didn’t have a lot of minority or immigrant populations and to think about when refugees intersect with citizens in these spaces, what did that look like? If I had told the stories of refugees in the twentieth century chronologically, it would wind up being divided by ethnicities, so each group would get a separate chapter. I was uncomfortable with that structure as I thought about race and immigration in Britain. I found when I took a theme like resistance or material culture or gender or family, you could see intersections and interactions that weren’t otherwise visible. What became the most startling part of the book to me is that there were all of these Britons living in camps that weren’t necessarily authorized, so the cast of characters became richer than I was expecting. Robin Lindley: Were there a couple of episodes or interactions that particularly struck you? Professor Jordanna Bailkin: Yes. The presence of Britons in these camps was definitely a shock to me. That was something I’d never heard about. The Polish camps were probably the places where the closeness between refugees and citizens was the most visible. It might be surprising to us today that the camps were not necessarily places where refugees and citizens were divided from each other, but they could also be places that demonstrated their intimacy and the proximity. Because I looked at the entire twentieth century, I could see recurrences that were striking to me. Almost every generation of camps would have these twinned accusations of being too luxurious and too barbaric at the same time. That happens with every generation of camps. You get critics of the camps from both directions: saying these people are too coddled and getting everything for free, or that conditions are degrading—depending on the speaker’s views of the welfare state. The critiques of the camps are very much a reflection of ideas about the poor and the homeless in Britain. Some critics would say it was terrible that so little was being done for these refugees and we can’t expect people to live like this at all. That incongruity between camps being seen as too barbarous and too luxurious suggested a lot about what people expected states to do for citizens and noncitizens alike. Robin Lindley: What sorts of Britons showed up in the refugee camps? Were they mainly squatters or homeless people? Professor Jordanna Bailkin: Some of them were, especially in the Polish camps. There were demobilized soldiers and their families who squatted in Polish camps. Some of those people had been denied council housing and were designated “problem families” by local authorities. Refugee camps weren’t just used for foreign people who had been displaced overseas, but they were also used by “problem families” who were very much local and British. That was an unauthorized use of the refugee camps. So, there were squatters and there were also official “centers” for homeless Britons located within refugee camps. The National Assistance Board took over the care of Polish refugees in 1946 and, two years later, reconstituted the way it was treating homeless Britons. In 1948, the Board created a center for homeless Britons inside a Polish refugee camp. Poles and Britons were not supposed to sleep in the same huts, for example, but they had the same cooks, the same warden, and the same stores of clothing. So there was an interaction in this camp that was not necessarily expected. Robin Lindley: Did authorities just wink at Britons living in refugee camps, or was this situation officially approved? Professor Jordanna Bailkin: It was both. The squatters were completely in rebellion against the state. So that happened without state authorization. And authorities had to make an awkward decision about whether they were going to send in military forces to displace British veterans from the camp for Poles. They decided not to do that, so the squatters stayed. In the case of the Kelvedon Camp, the center for homeless Britons was actually set up by the National Assistance Board so those Britons were there with the authorization of the state. And I also interviewed Polish refugees who remembered English “wayfarers” or “vagrants” walking through the camp or sleeping outside or in ditches, or breaking into huts that refugees had vacated. So, there was always a British presence in refugee camps and, in accounts, that’s sometimes openly acknowledged and sometimes not. Robin Lindley: It’s remarkable that millions of displaced Britons were facing extreme deprivation with food rationing and homelessness following the Second World War, yet the British were willing to assist refugees. Professor Jordanna Bailkin: It’s important to note how many Britons were living in conditions of displacement. Many were living in Nissen huts and experiencing being displaced from their homes. One big question the welfare state had to answer was how to deal with that domestic displacement in relation to stories of the stories of displacement overseas. Was it the same to be a homeless Briton bombed out during the Blitz and a refugee from abroad? Are there advantages that citizens have that refugees did not? Were refugees’ needs like the needs of the British poor or the elderly, or were they distinctive because they’d lost their homeland, their culture, and sometimes their place of citizenship? Different authorities had a range of responses to these questions. Robin Lindley: There seems to be a British humanitarian impulse in setting up these refugee camps. Were they also responding to some legal edicts that required them to house refugees? Professor Jordanna Bailkin: That’s a complicated issue. With many of these cases, the legal right of displaced people to enter Britain was unquestioned, such as with the Ugandan Asians and the Anglo-Egyptians who had British passports. One of the peculiarities of refugee history in Britain is that you can be a refugee and a citizen at the same time. Although the expulsion of Asians in Uganda did not occur until 1972, even in the sixties British colonial representatives predicted that the new African leaders would kick out their Asian populations, not just in Uganda, but in Kenya and elsewhere. They had to prepare for thousands of “African Asians” who would arrive in Britain and had a legal right to be there. They had to consider where to put them. Would they encourage them to go back to India even though they had not recently come from India? Or encourage them to emigrate to Canada or the United States? The Colonial Office and the Foreign Office considered that question for more than a decade. People who remember the Ugandan Asian crisis remember what felt like a very rapid, almost overnight emergency when people were camped out in airports and train stations. The response to these growing crises was to pretend they were not happening so they became emergencies. The state had a real investment in the creation and sustenance of emergencies rather than preparing for what turned out to be almost constant refugee crises. There’s a real divide between people who worked with refugees directly such as aid workers who wanted to create long-term or permanent structures for refugee aid, and the Home Office that treated each crisis as discontinuous and disconnected from previous crises, and nothing to do with Britain itself, so that each crisis became its own emergency. Robin Lindley: You detail the conditions in various camps. In terms of camps, the British are often credited with or blamed for the creation of concentration camps in South African during the Boer War in the 1890s as a means to concentrate, detain and control hostile populations. Does this history tie into your study of the refugee camps of the twentieth century? Professor Jordanna Bailkin: The person who knows the most about the South African camps is Aidan Forth from Loyola who just won a prize from the North American Conference for British Studies for his new book, Barbed-Wire Imperialism. He’s written a wonderful book on the camps in South Africa and also on the enclosure camps in colonial India and argues that these camps are generative and became the model for twentieth century camps. Those camps are more standardized than the camps I look at in Britain, which were very diverse sites where people had a lot of different experiences. I would agree that part of what defines a camp in the British or imperial context is the twinned experience of aid and detention. What makes a refugee camp a camp is that it’s a place to receive aid but it’s also a place where freedom is constrained in some ways, mostly in terms of physical and political freedom. Robin Lindley: It seems that there was a spectrum in terms of detention and freedom in the camps you examined. Professor Jordanna Bailkin: There was a lot of variety. That’s one of the ways that the camps differed the most from one another. Some of them were completely open and people could come and go pretty much freely, and others were under armed guard and surrounded by barbed wire. The camps on military bases had more of a restrictive structure to them that preceded the arrival of refugees. But the Home Office also hired private security firms to man the gates of some of the camps, certainly by the seventies and eighties for the Ugandan Asian and Vietnamese camps. Something I found interesting and thought about doing a new project on is that the company Securicor that provided security at those refugee camps runs immigration detention centers today. This company that started out with security work in twentieth century refugee camps has built a multibillion-dollar industry of detention in the twenty-first century, as I note briefly in the epilogue of the book. Robin Lindley: Which populations were most likely to be detained or held in secure areas? Professor Jordanna Bailkin: The idea of detaining refugees starts with interment during the First World War and those internees were actually refugees. The same people could be defined as refugees one day and as undesirable aliens the next. The Belgians were the first group of refugees in the book chronologically during the First World War. They had a lot of free movement in and out of Earls Court, where many of them were originally placed, but there were rules about where Belgians could settle having to do with national security issues at the time. They tended to be dissuaded from coastal areas and they had to register with local police in certain areas. So there were always some restrictions. The Jewish men arriving at Kitchener Camp in the thirties had to apply for permits to leave the camp. And there’s a picture in the book of the big, heavy gate that closes the camp. One simply didn’t just walk out and leave the camp for the day and go out into the town of Sandwich. You had to apply for a pass from the guard. Other groups like the Basque children at North Stoneham (in the late thirties) were seen as completely uncontrolled. This was a big problem for camp authorities who were always trying to wrangle these kids back into the camp. There was a barbed wire fence around the camp, but the kids were constantly escaping: running off into the forest or into the town. Some of those kids were older adolescents who didn’t want to be in the camp anymore and just left. Robin Lindley: It seems there was quite a lot of sexism with officials fearing that local women would seduce refugee men, or that refugee women would seduce local men. Males were also a concern. Professor Jordanna Bailkin: Definitely, and in both directions. With the Basque children, there was a concern that English men would come into the camp and try to seduce teenage girls. And that the Basque teenage boys were feared as trying to corrupt local girls. So many fears and anxieties spilled out. Robin Lindley: And many romances. Professor Jordanna Bailkin: Yes, especially between volunteers and refugees because many of the volunteers were university students who were actually living in the camps themselves. Robin Lindley: Weren’t locals generally tolerant of refugee neighbors? Professor Jordanna Bailkin: That varies a lot, not just in tolerance but in awareness—how focused people were on camp. Did they acknowledge the camp was there? Did they see it as part of the life of the community? There are a couple of cases in the book where there was close connection between a camp and a town, but there are other places where the camp was ignored and not seen as integrated into the life of the community. One of the things I try to show in the chapter on material culture and the environment with the camps on military bases is that these bases had long histories in their communities as celebrated but sometimes resented. The reaction to the refugee camp doesn’t only have to do with prejudice against a particular group of refugees but also with the history of the base and how the base figured into the life of the community. Sometimes the base had been a place of commemoration where people would go to celebrate veterans or to see demonstrations with airplanes. But other times, especially if they had been American bases, there had already been quite a bit of friction between the town and the base, so reopening the base for a refugee population reactivated those older memories and resentments in complicated ways. People had their own relationships with those bases that transcended the moments when refugees lived there. Robin Lindley: In some situations, refugees were very isolated, especially with small groups of refugees. There were small camps and then the use of those corrugated-metal Nissen huts. Professor Jordanna Bailkin: It depends on the camp. In the Basque camp at North Stoneham, there were tents set up in open fields for the Basque refugees. That was a different physical experience than a Nissen hut which was a different experience than in a country home or an estate. So refugees in Britain could have many different experiences of camp life. For the Ugandan Asians, at times, even one person may have multiple experiences as they moved from camp to camp. As the number contracted and more people settled in communities, many Uganda Asians were moved from one camp to another as a way to consolidate the refugee population. That meant one person might experience three or four different kind of camps that would be very different from each other. Robin Lindley: In the US now, separation of refugee families is a controversial issue and children have been separated from parents under the current administration. What did you learn about family separation in these British camps? Professor Jordanna Bailkin: That’s a very uneven story. There were moments when the state promoted reunification of refugee families, and other moments where the state was either inadvertently or explicitly involved in family separation. Part of this has to do with the definition of family. The state was not necessarily working with the same definition of family as refugees. With Ugandan Asians, the question was whether to use the British nuclear family definition or the multigenerational definition. They might separate grandparents and grandchildren, but keep parents and children together. The place where I found this heart wrenching was with single Poles who felt the refugee camp became their family. At some point, single people were kicked out of the Northwick camp. Officials said Northwick would be a family camp and planned to disperse the unmarried refugees elsewhere. But you get these powerful letters from mostly single Polish men saying that the camp residents are their family and that they can’t have their own families because they were injured in the Second World War. So, they really advocated for their own, more expansive definition of family than the welfare state was willing to accommodate. That was a fascinating example showing the challenges for refugees of working with the state’s definitions of family. Robin Lindley: Did you find any situations akin to what we’ve seen recently with refugees to the US where children are separated from parents and detained and even kept in cages? Professor Jordanna Bailkin: No. I looked at two sets of child refugees: the Basque children and the Jewish children of the Kindertransport. Their parents knew they would be separated from them. The brutality of those debates was really about who counts as a child, and that echoes very much today. Now, all kinds of medical technology are employed with Syrian refugees trying to come to Britain. They may x-ray teeth to see if refugees are really children. And there’s all of this anxiety about people trying to disguise themselves as children and slip into the country as children. Those very fraught debates go back to the period I’m looking at. There were debates about the chronological parameters of being a child, by which the British mean being young enough to be apolitical. With the Basques, they felt that, as the children became adolescents, they would become communists or become anarchists, and have radical political associations that are disruptive to British political life. Britain wanted to save these innocent children from Franco and fascism but, if they’re too old, they’re no longer seen as innocent but are feared as ideologues who could cause disorder. So, there was always this tension about who gets to be counted as a child, and whether refugee children are truly “innocent” children at all. Robin Lindley: It seems that many politicians preferred to aid homeless Britons before refugees. Professor Jordanna Bailkin: That story changes a lot over the twentieth century. The refugees became a sign of everything that was wrong with immigration in anti-immigration politics that called for closing the border. But they could also be privileged over ordinary or economic migrants, especially in the sixties. So, there was a lot of ambivalence in how refugees were positioned in relation to others who were mobile against their will or for reasons that they didn’t necessarily choose. Robin Lindley: That gets to the definition of refugee, which is also complicated. We usually think of refugees as fleeing persecution or injustice or violence. Professor Jordanna Bailkin: That goes back to the 1951 definition of the refugee, so it’s a Cold War definition. Laura Madokoro has written a terrific book about this issue regarding the exclusion of East Asian from the UN’s definition of refugee. Her book, Elusive Refuge, was influential in my writing on who that UN definition includes and excludes. In Britain, this situation is more complicated with refugees who also have the right to legally enter Britain. That’s true for not only the Ugandan Asian and the Anglo-Egyptians, but the Poles were also offered British citizenship because of their military service. So, there’s not always a clear line between a refugee and a citizen in Britain the way there might be elsewhere. Robin Lindley: And you discuss the Vietnamese refugees following the Vietnam War and the policies of dispersal both in Britain and the US. Was Britain following the US lead in dispersal of Vietnamese refugees? Professor Jordanna Bailkin: I didn’t find any explicit connection to the American imperatives or American precedents. What’s different with refugees is that the camps became mechanisms of dispersal for many camp officials. They were places to hold people while they made up their minds where to settle. Many camp leaders believed that the longer people stayed in camps and the more people went to camp instead of directly into the community, the more control they could have over their place of settlement. You had letters from the Home Office to camp officials saying to remember they couldn’t hold people against their will and to remember there was no legal way to tell Ugandan Asians in a camp that they can’t move to Leicester. But there was an enormous effort to dissuade people—again ineffectively and unsuccessfully. One of the reasons people were moved so much within the camp system was to try to accomplish the goal of dispersal. If someone was asked about job plans and said I want to go to Leicester, they might be moved to another camp that is farther away, disrupting all of their plans for finding a job and finding housing all over again. I think refugees present an opportunity that migrants do not for the state to have more control over where they live. They represent the possibility of controlling the settlement of people of color in Britain that has been tried (and failed) for other populations. Robin Lindley: The US administration today is raising concerns about criminal refugees. It doesn’t seem, however, that crime was a major factor concerning refugees in Britain. Professor Jordanna Bailkin: There were some attacks on refugee camps by the National Front and other right-wing organizations, but they tended to be around issues of employment rather than crime. There were a few incidents of riots in the Basque camps, which sparked British fears about refugees turning into criminals – all the more so because the Basques were supposed to be innocent victims of fascism. Robin Lindley: Was that reaction to Basque children because of a concern about communism in the late thirties? Professor Jordanna Bailkin: Yes, but it also had to do with the definition of a child. There were Basque boys who rioted around poor conditions where they were accused of attacking locals and saying that they were underfed and underhoused. There was a concern about their radical political nature and also a concern about the potential violence of unsupervised male adolescents. I try to look at these incidents in the book from both the perspectives of the Basque boys and of locals making accusations. In general, the accusation of criminality among refugees did not play a huge role in British debates. Robin Lindley: Your research was extensive on this forgotten or hidden history—and you unearthed so much. You captured unknown stories that might otherwise be lost. Professor Jordanna Bailkin: One of the important aspects of the research for me was making sure that I spent a lot of time in the local archives. I knew the National Archives well and they were a tremendously rich source. But in the local archives you see that many of the policies dictated by the central government were not being carried out in the way they were envisioned. There were very different executions of the policy reflected in the local record. You also get a different picture on how the camps fit into their local environments. Did locals care about this camp or not? Often the local records were more personal and more visceral. The evidence I found about personal connections between refugees and citizens tended to be from local archives. That’s where you see people saying I had never met an Asian person before I started volunteering at this camp. Robin Lindley: And you did a lot of interviews with former refugees and volunteers. Professor Jordanna Bailkin: Yes. I did quite a bit of oral history work for the book. That was fascinating partly because people gloss over this moment of encampment in their life and don’t necessarily want to talk about it but, once they did, they had very vivid memories of this time of encampment. And it was a very explicit decision to not only talk with people who had lived in the camps as refugees but also to talk with people who worked with them and volunteered with them to get a sense of the whole of the camp such as the on the ecology and demography of it. The volunteers were interesting to me because they had mostly been very young, idealistic, anti-colonial, and they saw their time in the camps as pivotal in their lives. I talked to quite a few people who said that experience had changed their lives and that’s why they started in social work or why they worked with the homeless. The also developed an interest in the region or country of the refugees they worked with. For many volunteers, that time in a camp was transformative. Robin Lindley: And you noted that some politicians criticized those idealistic volunteers. Professor Jordanna Bailkin: Yes. They were at odds with the state in many ways. And they often clashed with state authorities within the camps. Robin Lindley: We’re at a different point in history now in the US and Britain. Britain also has a different legal system, but do you think US can draw some lessons from the British refugee experience that you studied? Professor Jordanna Bailkin: Yes, I think there are important precedents because Britain is also a liberal democracy that experienced persistent refugee crises over the course of a century. One lesson is that because of the intimacy of refugees and citizens, it was never really possible for Britons to distance themselves from camps in the same way that we have all been able to do in the twenty-first century. In Britain there was a closeness of contact with refugees in terms of marrying refugees, or sharing material conditions with them, so in many ways Britons could not see refugees as being different from themselves. That’s one lesson for all of us to take away in this new century of camps—that camps don’t need to mark segregation of people, but they can also be places where other kinds of relationships develop. Robin Lindley: In the US there’s a general lack of understanding that people from outside the country who feel imperiled have a right to apply for refugee status under international agreements that we have signed onto. Do you have thoughts on the legal requirements or increasing the understanding of our citizens about refugee rights? Professor Jordanna Bailkin: I think this has changed tremendously in Britain as well. One reason my story stops in the 1980s is because that’s when Britain’s laws on asylum became much more restrictive. There were, for example, new punishments for ships that bring people into Britain without proper documentation. Those carrier companies can be fined. An effect of those new laws was the end of refugee camps in Britain. Some camps were pushed out of Britain to places like the now dismantled “jungle” in Calais. In Britain, the camps have been replaced by detention centers so you have the end of one institution that was supposed to settle refugees and the rise of another explicitly only designed to detain them and ultimately to deport them. Sometimes these detention centers are in similar spaces as the refugee camps and sometimes involve the same security companies that had been involved in refugee camps. So there are continuities from the twentieth century experience. Robin Lindley: And the private company Securicor is involved in creating detention facilities in the US too? Professor Jordanna Bailkin: Yes, it’s an international company and is involved in Australia as well. I think there’s a definite shift to detention now, but it’s important to remember that the refugee camps of the twentieth century always had elements of detention. The infrastructure of detention has grown tremendously, but it was made possible and facilitated by some of these antecedents of constraining refugee freedoms within Britain. Robin Lindley: Are you following up on these issues in what you’re working on now? Professor Jordanna Bailkin: Yes. I’m very interested in the history of private security and tracing the origins of private security in Britain and its empire. I’m also working on a totally different project about friendship and neighbors in modern Britain. It’s a shift to a more cheerful topic! I’m interested in how the state invested in relationships that were not marriage. There’s been great research on how the state regulates romantic relationships and marriage, but I’m really interested in relationships that fall below the state’s radar. Friendship is ungovernable in some ways and yet it’s also essential to the contemporary state. You start to see by the late forties that the state has an investment in friendship and neighborliness and other social ties outside the nuclear family that makes it seem an altruistic effort. I’m trying to figure out how that happened and whether people did feel differently about their friends, neighbors and families in the wake of some of these economic, social and political transformations that took place with the rise of the welfare state. Robin Lindley: I look forward to your new projects Professor Bailkin. Thank you for your thoughtful comments and congratulations on your new book about Britain and refugees, Unsettled.